James Harron waited until one month before the inaugural Everest to lock in his runner and he’s playing a patient game once again. Of course, Harron secured the right to run Redzel in 2017. With the news the defending champion will run in the Yulong Investments slot come October, Harron said he’s happy to sit back and let the game unfold further. “Five months out we feel it is a bit premature,’’ Harron said on Sky Sports Radio. “In saying that some fantastic horses have been locked in. Redzel (Yulong), In Her Time (TAB) and Trapeze Artist (Aquis) make up one quarter of the field for the $13 million The Everest (1200m) run at Royal Randwick on October 13. Harron has been an enthusiastic supporter of the Everest “wonderful concept’’ since it was announced. While many thought a second crack with Redzel would be on the cards, given the success last spring, Harron sprung a surprise with a curious tweet on Sunday forecasting he’d be heading in a different direction. He said he’s been keeping a close eye on a number of horses and hinted at a blueprint for what he’s looking out for. “I think there are a lot of elements that come into play,’’ he said. “It’s a grand final race and it has to be the grand final for that horse. I tip my hat to the other slot holders, they’ve picked up some fantastic horses. Redzel and Trapeze Artist share TAB favouritism for the Everest at $5, ahead of In Her Time ($7). Happy Clapper’s ($15) trainer Pat Webster has said he’d like to secure a slot sooner rather than later so he can set the popular gelding for The Everest first-up. Last year’s runner-up Vega Magic is set to return in the Group 1 Goodwood (1200m) in Adelaide on Saturday week as he presses his claims for another slot. Robert Sangster Stakes winner Shoals ($26) has had retirement shelved and a Royal Ascot trip deferred as owners John Messara and Johnathan Munz set their sights on the race too. 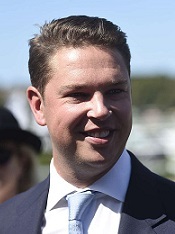 And trainer Lloyd Kennewell is hoping his star mare Viddora, scratched from the Sangster due to a minor injury, will have a second chance to impress in the Goodwood. The Everest might be five months away but the game is well and truly on.